For today's tiny vintage photograph, we go all the way back, almost certainly, to the 19th century. 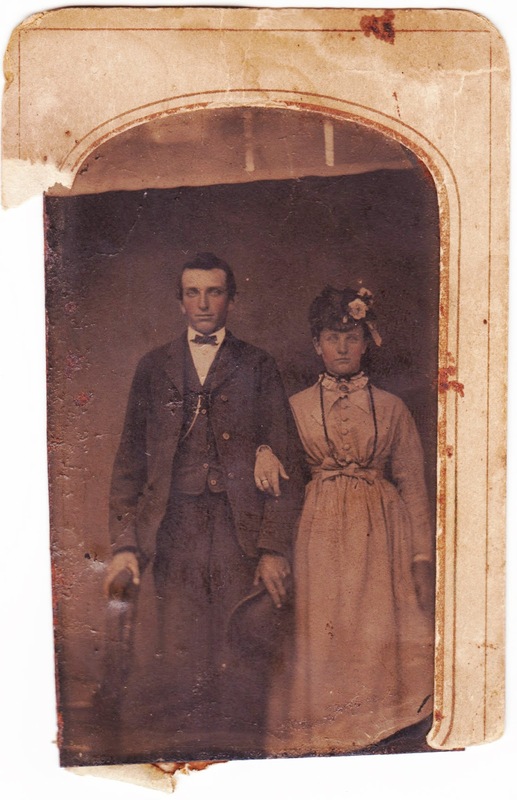 This beat-up old tintype1 of a man and woman only measures 2½ inches across, if you count the paper mat. 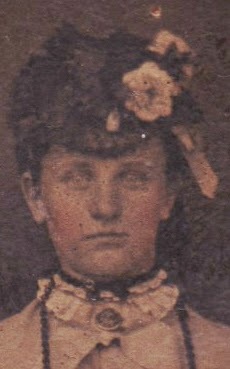 The image itself is only about 1½ inches wide. First things first, let's take a closer look at the couple. I've also brightened the image ever so slightly. They seem happy enough. If they seem a little rigid, that would be another sign that this is from the 19th century. The process of taking a portrait involved putting on your finest clothes and getting groomed to perfection. Then you had to be posed just right by the photographer. Then you had to wait for the photographer to load film into the camera. Then you had to remain SUPER STILL for the three to eight seconds required for the exposure.2 So we should forgive them for looking a bit stiff. First off, she has her fingers crossed, which might or might not have meant anything. Second, it appears that she's wearing her wedding band on her right hand. But that's when I learned something, which is one of the coolest things about writing this blog. 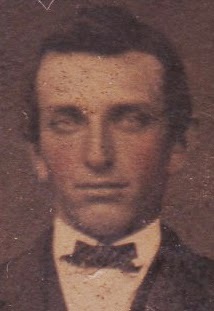 Most tintypes produced mirror images. So that's her left hand, which would make more sense with regard to the ring.3 The mirror-image theory is further supported by the man's jacket buttons, which incorrectly appear to be on the left because of the lateral reversal of the image. So tintypes, unlike modern photographs, flipped reality. Moving along, let's zoom in on their (mirror image) faces. No one, sans magnifying glass, has ever been able to see them so clearly. Finally, flipping the photograph over, here's what the back looks like. Copies made from all Styles of Pictures. 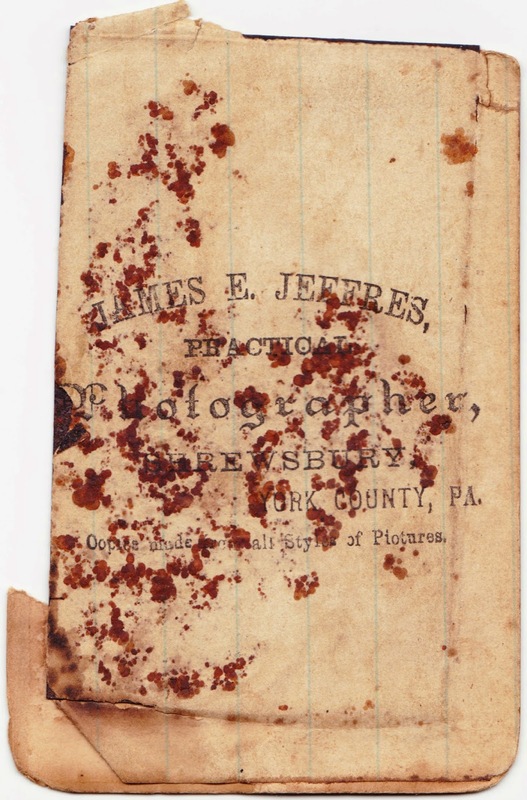 I couldn't find much about Jeffres.4 No studio address is listed, so it's possible that he traveled around southcentral Pennsylvania and did his work from a portable booth. For all we know, this photograph was taken at the York Fair! 1. 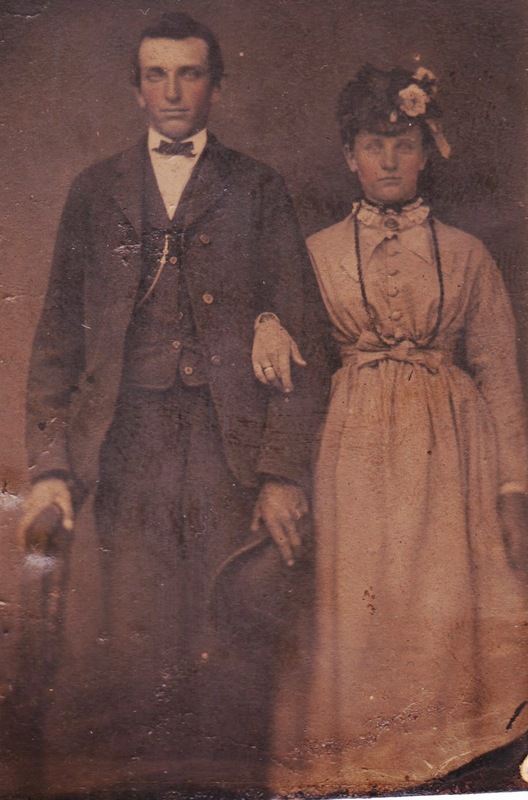 Tintypes had their heyday in the 1860s and 1870s, but remained widespread into the early 20th century. So, as I said, the odds are that this photograph was taken in the second half of the 19th century. 2. Source: Grant Romer discussing portraits in the mid-19th century on PBS' The American Experience. 3. Before I made the mirror-image discovery, I had found some evidence (now unnecessary) to support why a wedding band might appear on a woman's right hand. According to Wikipedia: "In Germany the ring is worn on the left hand while engaged, but moved to the right hand when married. In Poland and Turkey, the engagement ring and wedding band are traditionally worn on the right hand but modern practice varies considerably." 4. Fifteen years ago, someone tried to track down information about Jeffers on a RootsWeb forum but received no answer. Tiny photos #1: Tuck in your shirt!